A perfect way to give your gifts on Christmas Day. 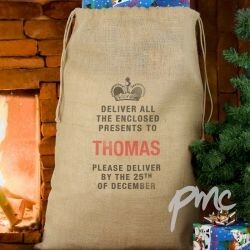 Personalise this Sack with a name up to 12 characters in length.The words 'DELIVER ALL THE ENCLOSED PRESENTS TO' and 'PLEASE DELIVER BY THE 25TH OF DECEMBER' are fixed. All personalisation will appear in UPPERCASE.